Leland and Tommy know The BEST CASES in The Hobby at the LOWEST Prices in the Galaxy are at Sports Cards Plus, a.k.a. The Super Hit Factory. Our initial shipment of 2014-15 Immaculate Basketball arrived at 11:30 Wednesday and it didn't take long for customers to start busting into our cases. 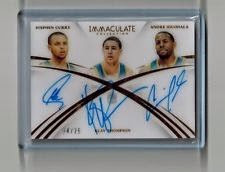 This year's Immaculate Basketball is loaded with beautiful new Super Hits including Scott's Golden State Warriors Triple Autographed Card. 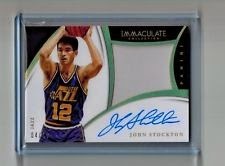 Click HERE to see this card and Scott's other amazing Immaculate Basketball pulls. 2014-15 Immaculate Basketball boxes are only $499.95 (prices subject to change as demand increases) at The Super Hit Factory. 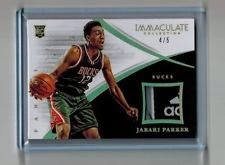 Get in our daily 2014-15 Immaculate Basketball Box GROUP BREAK (6:00 p.m.) for only $89.95 per spot with EVERY SPOT getting ONE Random Card from a factory sealed box. Don't forget................ Our Immaculate Basketball Week SALE continues...... At Sports Cards Plus you ALWAYS get the BEST BOXES at the BEST PRICES. So what are you waiting for? Do like Sports Cards Plus customers do. Go to Sports Cards Plus TODAY and have some fun!